‘Cici’ was plucked out of a bush this evening on the north side of Syracuse. Just old enough to have been weaned and wandering from mom, but young enough not to be feral yet, it is Cici’s lucky night. She is in a temporary foster home at the moment but can not stay long because there are too many other cats in the foster home already. Cici is approximately 10-12 weeks old. 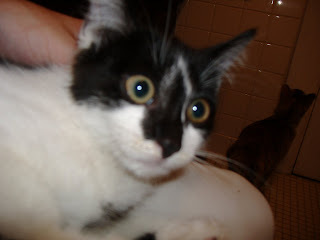 She is a black and white kitten with a handsome white zigzag between her eyes. Cici needs an adoptive forever home, but in the meantime, she needs a temporary foster home to stay for a month or two until she gains the extra pound she needs to be spayed. This entry was posted in Uncategorized on August 5, 2010 by saro.